Pre race team shot. Photo Joanne Stone. 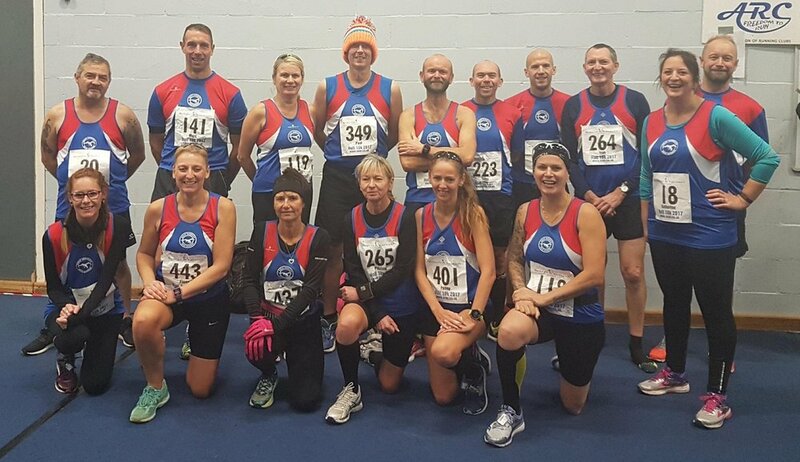 North Norfolk Beach Runners hosted the Holt 10k which started and finished in the grounds of Gresham’s School. The course was mainly on roads but did include an off-road trail section and grass sections at the start and finish. 362 runners completed the course. They had a few undulations to contend with along the way. Couple that with cold and windy conditions team GYRR put in some very good performances considering. Firstly, huge congratulations to four of the eighteen GYRR who did manage to record personal bests: Paul Reeve, Gemma Aylen, Fiona Williams and Katherine Audus; big smiles all round. Credit is due for Marc Evans who managed 12th place overall in a time of 37.46. This race was also a decider for the Leathes Prior Grand Prix series. With several GYRRs battling it out for a top three finish over the ten-race series it made for an exciting race. None more so than in the ladies 55-59 age category where two team mates went head-to-head. A special mention must go to Pauline Leeves and Lorrain Dawson who were battling it out for the top spot. Pauline triumphed in the end with the bonus of winning her age group trophy for today’s race too, but very well done to both ladies who continue to overcome adversity to race consistently well. A warm welcome back to racing goes to long standing member Steve Stringer. Steve likes to compete in other sporting challenges such as triathlons and Half Ironman competitions but made a great comeback to pure running today to finish strongly in 52.57. Marc Evans 37.46, James Carass 41.26, Mark Stone 43.38, Paul Reeve 44.31 (PB), Terry Hubbard 46.00, Penny Studley 46.39, Pauline Leeves 49.14, Emma Dawson 50.44, Julie Webster 51.22, Rob Bailey 51.34, Lorrain Dawson 51.36, Steve Stringer 52.57, Ivan Lees 54.02, Gemma Aylen 54.16 (PB), John Bound 56.05, Fiona Williams 58.43 (PB), James brown 1.04.51 and Katherine Audus 1.06.43.